Dutch design firm Kampman Architecten has developed a roofing solution to link some factory buildings of Crepa to the showroom area. The factory is located in Assen, Netherlands. The PVC tensile structure that was used also determines the image for this company along the motorway. 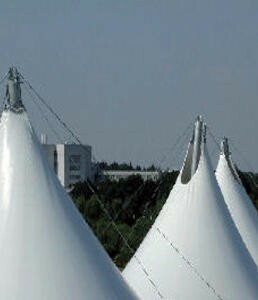 The tent is not connected to the existing structure. The connection with the adjacent buildings was too expensive and, therefore, they chose to use tied down V-masts. This was not an obstacle in view of the nature of the customer’s operations. The projection line of the three masts was selected randomly to ensure that the structure was given a playful image. Indirect lighting on the bottom of the membrane produces a fragile image. The lighting is suspended halfway at the bottom and has been neatly concealed.